Tomorrow, 29 April 2014, there is a new moon and also a solar eclipse. It will be an annular eclipse rather than a total eclipse - meaning that the sun will look like a ring of fire as the moon passes in front of it. Sadly the solar eclipse won't be visible from the UK. Antarctica will get the best view - where I guess it will mainly be witnessed by penguins - although people in Australia will be able to see much of the eclipse. For those of a superstitious inclination, eclipses are anticipated as times of great change - often times of upheaval. And at the moment it seems many people I know are going through big changes in their lives, with much uncertainty and fear about what the future holds. I'm not talking apocalypse predictions - if you've read my blog for any length of time you will know I'm sceptical about prophecies of Armageddon, Ragnarok, comings of Gozer the Destructor or any other end-of-the-world scenario. But we do live in troubling times, with worrying environmental, economic and political problems yet little hope of any easy solutions. In fact, many feel that some tipping point has been reached. Not the actual end of the world, but certainly an inexorable slide to the end of our comfortable world as we have known it. Some believe that we are rather at the moment when only drastic measures can avert eventual disaster. Perhaps those feelings have at least a bit to do with the eclipse energy we are all experiencing. If you do decide to embark on drastic measure or action for change - either for something within your own life or for the world as a whole - do so with the good of all in mind. There is a lot to be said for the Wiccan ethics of "Do what you will, but harm none". 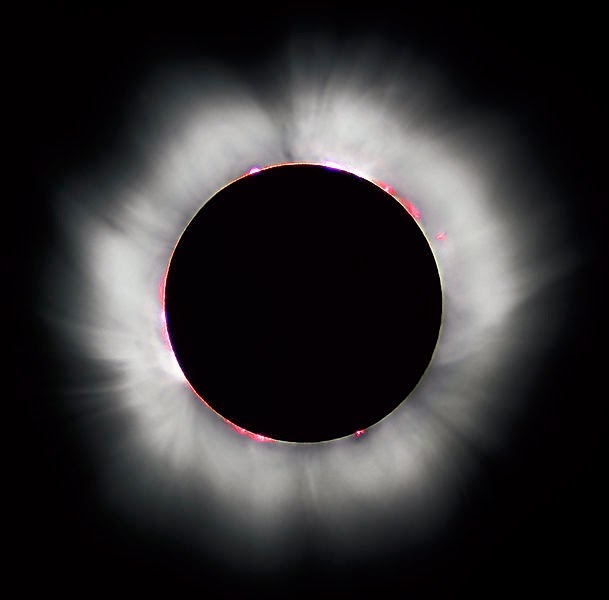 The solar eclipse will begin at 3.53am UTC time and 4.53 London time. It will end 8.15am UTC time and 9.15am London time. The new moon is at 7.14am London time. The NeoPagan name for this new moon is the Awakening Moon. This eclipse now leads the way to the next Total Solar Eclipse visible from Europe on March 20, 2015. The last in Europe was back in August 1999. More details from this dedicated Total Solar Eclipse 2015website for the event.